Meeting with Pope Francis on Monday, Turkey’s president pointed to the harm that would result from the recent U.S. decision on Jerusalem, stressing that it should never be put into practice. 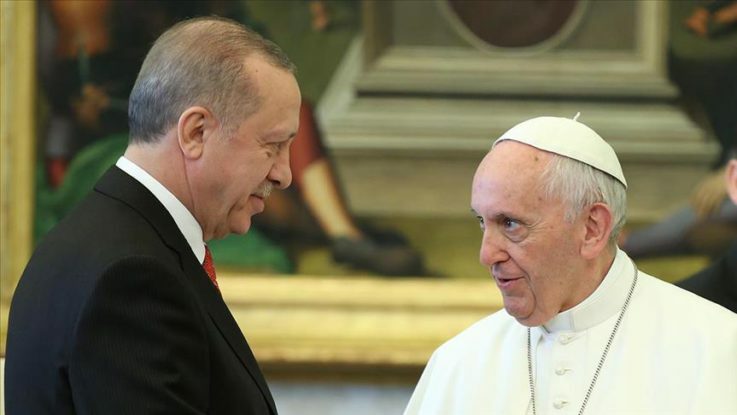 President Recep Tayyip Erdogan’s one-on-one meeting with Francis at the Apostolic Palace at the Vatican was “extremely amicable,” according to presidential sources. During the meeting, the two leaders discussed Jerusalem, the ongoing refugee crisis, and developments in the Mideast, primarily Syria, as well as terrorism, and interfaith relations, said the sources, who asked not to be named due to restrictions on speaking to the media. Erdogan and the pope asserted the protection of the status of Jerusalem — sacred to Muslims, Christians and Jews — as laid out by UN resolutions and international law. Francis was one of the most prominent international leaders to criticize the U.S. decision last December to recognize Jerusalem as Israel’s capital, and Erdogan thanked the pope for his messages on the issue. Similarly, the pope expressed admiration for Erdogan’s efforts on Jerusalem as well as its welcoming stance and help for refugees. Erdogan also spoke to the pontiff about Turkey’s counter-terrorism efforts and operations in Syria. Joint efforts against xenophobia and Islamophobia were discussed during the meeting, with the leaders stressing that equating Islam with terror is wrong. They instead stressed that all actors must avoid any provocative remarks promoting this false equivalency. Erdogan told the pope that Turkey values people from all religions — including Catholics — living in harmony and peace and for that reason the Turkish government has restored 14 churches and a synagogue. Erdogan and Francis agreed that joint steps are needed to mobilize the international community to forge regional peace and stability, and not be silent towards ongoing humanitarian crises. The two leaders also agreed to maintain relations in the future.